As Vince Bottomley explains, it may actually be more cost-effective to purchase a new bolt, rather than have your existing bolt milled and machined in the blue-printing process: "Accurizing a Rem 700 action is not a simple or cheap process. A lot of the work will be to the bolt itself -- truing the lugs, skimming the bolt-face, fitting a Sako style extractor, new bolt-knob and maybe a new firing-pin. Even then, unless you have the bolt sleeved, it will rattle like the old clunker it probably is! Don't waste your money! Go for one of the replacement bolts from Pacfic Tool & Gauge. PT&G offers a new bolt complete with new bolt-handle, firing pin, spring etc and the bolts come in different diameters so that you can get one to exactly fit your Remington action. This of course requires some accurate measuring, so it's best to get your gunsmith to order the bolt. They are [a great] value and will cost a lot less than up-grading your existing bolt." Rem 700 replacement bolts start at about $125.00 for the bolt body only (complete bolts are also offered). PT&G bolts are available with either a standard Remington extractor or a Sako-style extractor, with .223, PPC, .308, or magnum bolt faces. The tolerances rival that of the bolts found in custom actions. You can order direct from PT&G in Oregon, (541) 826-5808, or you can purchase through vendors such as MidwayUSA.com, (bodies only, search for "PTG Bolt Body"). 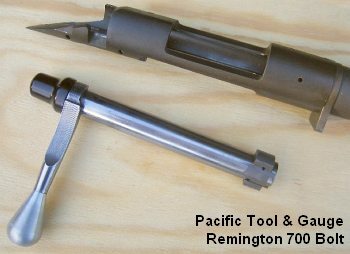 If you want a custom spec bolt, it's probably best to have your gunsmith deal directly with Dave Kiff at Pacific Tool.